St Thomas Aquinas says that there are so many different kinds of creatures in order to reflect the manifold perfections of God, since no one creature can come anywhere near the full greatness and beauty of God. That gives food for thought… In what way is God like a chipmunk? I don’t mean that facetiously, either. 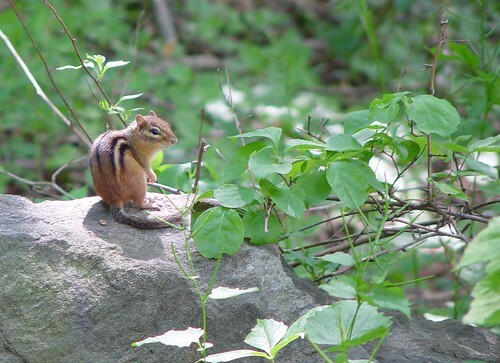 If all creation reflects God’s perfection, there must be some analogous way in which the chipmunk tells us about God. Some atheists or agnostics would use that as a “reductio ad absurdum” against Christian theology. It think it teaches us to appreciate the world more. I would think a chipmunk tells us that God is Nature: chipmunks are adorable and beautiful and friendly, but they are also both carnivorous and prey. So goes life. Or something like that. I’m not sure I expressed that very well. I’m not sure about the perfection thing, either, but maybe I just can’t see it. I’ve been thinking about that description since I put that up. It’s probably not very theologically or philosophically precise… but I do think that all creation speaks to us about God in some way. I’m still trying to figure out how it applies to chipmunks… Because it does have to take into account, as you point out, that they are not just “cute and cuddly”. If this idea is true about chipmunks, it’s also true in some way about slugs and the microorganism that causes malaria, so it’s not an easy question to answer. I’ll have to go back and review exactly what Thomas Aquinas says in order to see it clearer. The thing about “perfection” has specific connotations within a Scholastic theological and philosophical context that is not quite the same as in common language. I too think that all creation speaks to us, I’m just not sure (obviously) it’s speaking to us about God. I do wonder about things like slugs and malaria (though I kind of like slugs and snails, as long as they’re not on me LOL), and I guess that’s where my agnosticism (is that a word?) comes in: I see something like malaria, and that cancer that the Tasmanian devils get, those sort of things, as deviations from Nature’s norm — and I think it’s humankind’s fault, or we’re to blame, because we’ve evolved so fast and learned so very little about how to play well with others that we’ve messed up a lot of the planet. What’s a bit bizarre and funny is that I wrote this comment before joining this discussion: scroll down to what is currently the 9th image (Ninja Squirrel by K_Alinka) in the Squirrels Who Stand Like Max Schreck gallery. There you have it…. rodents will lead you to God one way or the other! That’s a hilarious group of photos! Except where expressly stated, all content is © 2000-2019 YawningDog. Unauthorized use or duplication of this material without express and written permission from this blog’s author and/or owner is strictly prohibited. Excerpts and links may be used, provided that full and clear credit is given to YawningDog with appropriate and specific direction to the original content.